CHARLOTTE FALL FESTIVALS OFFER FAMILY FUN | South Charlotte Newcomers! Charlotte’s beautiful fall weather is calling families outside for fall festival celebrations! Gather family and friends and enjoy the faint cool fall breeze whispering through the Carolina sunshine! No family member is more appreciative of fantastic weather more than the family pet! WOOFSTOCK is a “far out” festival for you and Fido at Amos’ Southend on Saturday, September 13! Food trucks will be there to feed the humans while they bid on silent auction items. Great Dane Friends of Ruff Love and the Blue Ridge Boxer Rescue are hosting this groovy good time. New, furry family members will offered for adoption. Charlotte is a fantastic city of cultural diversity! The Festival of India is a great way to learn about and celebrate Charlotte’s Indian community. Experience the richness of arts, crafts, languages and cuisines from different regions of India. A large food court will offer a wide range of Indian delicacies. Children will have their own activities to keep them engaged while mom gets a beautiful henna tattoo! Festival of India will be held at the Belk Theater at Blumenthal Performing Arts Center September 13-14. Travel from India and explore the entire world at the 39th Annual UNC International Festival at UNC Charlotte! This huge exhibition of cultures of the world is a Charlotte tradition. Learn about different lands as you meander through tents of displays and enjoy song, dance and cuisine. CHARLOTTE CRABS & BEER FEST is a delicious way to welcome fall on September 13! A Low Country Boil is a Carolina delicacy that is sure to please the entire family in Uptown Charlotte! Fresh Blue Crabs will be offered along with specialty beer, games, music and various vendors. Carolina Brewmasters, Charlotte Oktoberfest will be a September 27th celebration this year at the NC Music Factory. This is a charity event that has been contributing to nonprofits for over 15 years and is one of the largest beer fests in the Southeast. Great Grapes! Is a casual wine tasting with hundreds of wines to try! Held at Symphony Park at Southpark Mall, this stroll allows people to refill their tasting glass at each tent offering NC wines. Live music will be provided and patrons are encouraged to bring lawn chairs and blankets on October 4, 11am-7pm. A little outside of Charlotte, Shelton Vineyards will be hosting its Ninth Annual Harvest Festival October 10-12. This family friendly festival will include local craft items and produce for sale, hayrides and bluegrass bands. Enjoy the fun while sipping on your favorite Shelton Vineyard wines. Food will be available, as will regular winery tours and tastings. The 12th Annual Q-City Charlotte BBQ Championship and festival will be October 17-18 in Uptown Charlotte! Teams will cook and compete for the Governor’s Cup Trophy. Pork eating along with other food trucks and vendors will fill your tummy with yumminess while you listen to great music and sample some favorite beverages. Festival in the Park is a favorite Charlotte tradition! Held at Freedom Park, the festival has been serving up food, fun, music and original art since 1964. 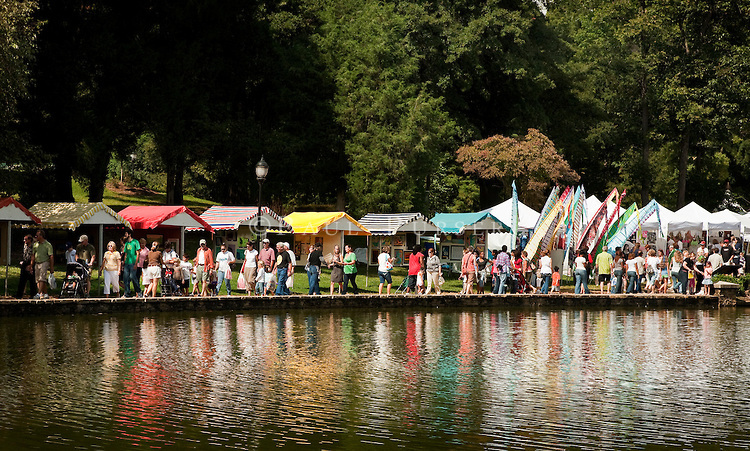 Over 180 artists and crafts people surround Freedom Park’s Lake. The festival will be September 19-21. Charlotte’s close neighbor, Statesville, is host to Carolina BalloonFest, the premier hot air balloon festival of the Southeast! On October 17-19 families can bring lawn chairs and blankets and enjoy the amazing sight of over 50 colorful hot air balloons. Take a balloon ride, enjoy the food and listen to the music! Benefits go to the American Cancer Society. No festival news would be complete without including the Carolina Renaissance Festival! This medieval amusement park will entertain you with everything from jousting tournaments to turkey legs to munch on. Enjoy the fun Saturdays and Sundays, October 4-November 23. Charlotte is the epitome of Southern perfection during the fall! Warm sunshine and cool breezes are beckoning you outdoors for fantastic fall fun frolics!